We R Memory Keepers PINK TYPEWRITER Typecast 310297 at Simon Says STAMP! 310297 This item is on reserve until If you would like to reserve this item now, you may purchase it now with the rest of your order. We will hold your order now and ship your entire order as soon as this item is back into stock. If you would like your order to ship now, please place this item on a separate order. 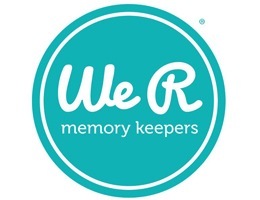 Success, We R Memory Keepers PINK TYPEWRITER Typecast 310297 has been shared! Please note that customers outside of the USA are asked to pay an additional $60 surcharge for shipping this pad overseas and a $50 surcharge to ship to Canada. A retro typewriter for the modern maker. Quickly add journaling to layouts, cards and projects. Unique colors in ink available (sold separately). Keep your projects and your space looking cool with this new, fully-functioning, retro-style Typecast typewriter and paper collection. Easily add custom typewritten text to layouts, planners, cards, tags, notes, labels and more. Fits various weights of paper and cardstock up to 12 inches wide. Quality internal metal construction, upper and lower case alphabet, symbols and numbers, compatible with standard ink ribbon, includes two-color red and black ink ribbon, margin and tab settings, adjustable imprint options, 4 line spacing options and return bell indicator. Approx. 12 x 14 inches. Paper feed is 12 inches.